The appointment of Iain Grandage as artistic director of Perth Festival for 2020-2023 received a highly enthusiastic communal thumbs-up when it was announced earlier this year. Grandage will be speaking at the Blue Room Theatre, Saturday 4 August, but Nina Levy decided to sneak in a pre-show chat. 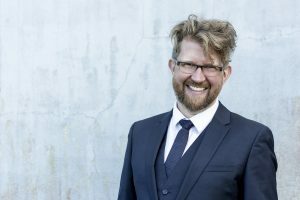 When acclaimed composer Iain Grandage was announced as Perth Festival’s artistic director for 2020-2023, back in May, there was a palpable buzz of excitement in the WA arts community. It was immediately clear that people feel a sense of connection with Grandage. While this communal stamp of approval can be attributed, in part, to the fact that he’s a local (raised and trained in Perth), I believe there’s more to it than that. Grandage has composed and played across numerous art-forms – opera, theatre, dance – with the result that he has the affections of an unusually broad range of arts-enthusiasts. He has won numerous awards for his work as a composer and music director, including an impressive seven Helpmanns for his compositions for theatre (Cloudstreet, The Secret River), for dance (When Time Stops), for opera (The Rabbits with Kate Miller-Heidke), for film (Satan Jawa, with Rahayu Suppangah) and as a music director for Meow Meow’s Little Match Girl and The Secret River. 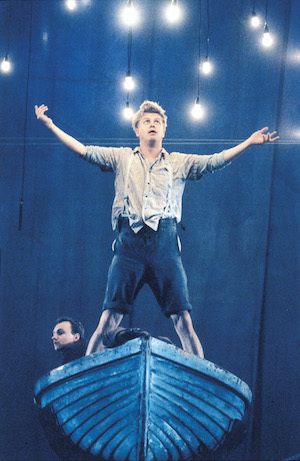 Grandage composed the score for Company B and Black Swan State Theatre Company’s production of ‘Cloudstreet’, pictured here at the 1998 Perth International Arts Festival (now Perth Festival). Photo: Heidrun Lohr. Personally, I first came across Grandage’s work back in 2006, at the Perth International Arts Festival (now Perth Festival). He had composed the scores for two dance theatre works presented at the Festival that year, Steamworks Arts’s The Drover’s Wives and Splinter Group’s Lawn. Rich soundscapes packed with drama, both scores seemed, to me, inseparable from the action, inextricably linked to the movement on stage. Twelve years later, then, I was thrilled to have the opportunity to talk to Grandage and find out about the process behind such compositions. When he picked up my interview call with a short song of greeting, my happiness was complete, in the manner of a teenager who has just acquired the autograph of her favourite pop star. Suffice to say Grandage is a delightful mix of creativity and general niceness. Originally from Brisbane, Grandage moved to Perth with his family in the mid-1970s and began his formal music training shortly after, starting piano lessons at age seven and cello at ten. Although he gave up piano at 13, he continued to play the instrument for pleasure. “I’d go to the music library and get books and books of pop songs, lots of stuff from the ’20s and ’30s… I don’t know why, I was really drawn to it,” he reminisces. “My dad’s dad was a linguist but also, as many people were back then, a composer. Because there were pianos in so many rooms, there was that great flowering of popular music that happened between the wars. So my grandfather, who my dad never even knew (he died when my dad was three months old), is a published composer. I often heard my dad play that piece and was drawn to music of that period. Iain Grandage. Photo Pia Johnson. There were two factors, he replies. “Firstly, I had a brilliant time in the music department at UWA. I fell in love with the fact that that music wasn’t just on the weekends, that you could do it day in and day out. ‘Perhaps my favourite dance experience was working with Gavin Webber and Grayson Millwood [Splinter Group] on a show they made called ‘Lawn’.’ Pictured at the 2006 Perth International Arts Festival. As aforementioned, Grandage has composed across a range of art-form, and I’m interested to find out what it is about interdisciplinary collaboration that appeals to him. Once again, it comes back to the fact that Grandage is a social being. Being an old school, traditional composer is like being a painter or a sculptor or a novelist. It’s a solitary creative pursuit. ‘For Natalie Weir’s ‘When Time Stops’, The Camerata of St John’s played live on stage and were just so fantastic and courageous in how they stood amongst fast-moving dancers and memorised huge slabs of the score.’ Photo: Chris Herzfeld. I love the idea of sewing these disparate lines together to make a festival that’s actually euphoric and filled with hope, and filled with a celebration of us in this place. Grandage directed the Port Fairy Spring Music Festival from 2016-2018 and, listening to him talk about collaboration across art-forms, it’s easy to picture him in his upcoming role of Perth Festival artistic director, directing across disciplines. “I’m very attracted to the act of storytelling,” he agrees. “Something that occurred to me across my time running the Port Fairy Spring Music Festival is the fact that you can make statements about society and hopefully make a small change for people by presenting a whole series of works that talk to each other and are beyond the creative powers of any single artist. In curating that small festival and now with the chance to curate this big festival you can program people with bigger brains than your own, who have ways of the viewing some of the intractable problems that face us as a society, but also those things that celebrate the great shared moments of humanity in ways that you find unexpected and joyful and never would have thought of yourself. So you can make a bigger statement, and make more of a difference. “Get to know Iain Grandage” at the Blue Room Theatre as part of “Winter Nights”, Sunday 4 August at 4pm. Iain Grandage is pictured top. Photo: Rhys Woolf.